This image is an artist's conception of the binary system WISE J104915.57-531906 with the sun in the background. Scientists have discovered the closest star system to the sun found in nearly a century. 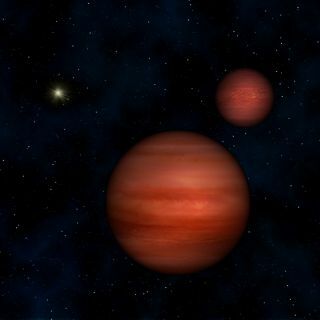 With a dim duo of "failed stars" known as brown dwarfs at its center, the new neighbor is the third-nearest to our solar system overall, and it could be a good place to look for exoplanets, researchers say. Brown dwarfs are strange objects that are bigger than planets but too small to trigger the internal nuclear fusion reactions required to become full-fledged stars. This pair is slightly farther away than Barnard's star, a red dwarf discovered in 1916 that lies 6.0 light-years from the sun. The closest system to Earth is Alpha Centauri, whose two main stars, Alpha Centauri A and Alpha Centauri B, form a binary pair that are about 4.4 light-years from the sun. Last year an Earth-size planet was discovered in the Alpha Centauri system, suggesting it may host other alien worlds as well. Officially named WISE J104915.57-531906, the newly discovered system was spotted in a map obtained by NASA's Wide-field Infrared Survey Explorer (WISE) spacecraft, which spent its 13-month mission scanning the entire sky 1 1/2 times, taking about 1.8 million images of asteroids, stars and galaxies. "One major goal when proposing WISE was to find the closest stars to the sun," said the mission's principal investigator, Ned Wright of UCLA. "WISE 1049-5319 is by far the closest star found to date using the WISE data, and the close-up views of this binary system we can get with big telescopes like Gemini and the future James Webb Space Telescope will tell us a lot about the low-mass stars known as brown dwarfs." Luhman noticed that this particular system seemed to be racing across the sky in the WISE images. "In these time-lapse images, I was able to tell that this system was moving very quickly across the sky, which was a big clue that it was probably very close to our solar system," Luhman said. Turning to older surveys of the sky, he spotted the system in images obtained between 1978 and 1999 from the Digitized Sky Survey, the Two Micron All-Sky Survey and the Deep Near Infrared Survey of the Southern Sky. "Based on how this star system was moving in the images from the WISE survey, I was able to extrapolate back in time to predict where it should have been located in the older surveys and, sure enough, it was there," Luhman explained in a statement. The star system's distance was measured by trigonometric parallax, which can only be done if an object is close enough to show an apparent shift in position relative to much farther background stars, due to the Earth's orbit around the sun. After obtaining a spectrum of the system with the Gemini South telescope on Cerro Pachón in Chile, Luhman also determined that the system has a very cool temperature and is actually made up of two objects. "It was a lot of detective work," Luhman said. "There are billions of infrared points of light across the sky, and the mystery is which one — if any of them — could be a star that is very close to our solar system." The research was published in March in Astrophysical Journal Letters.